Here's a really delicious lunch-box idea that's so much better than a plain turkey sandwich. 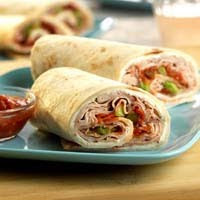 Picante sauce and avocado pair perfectly with sliced turkey, and it's all rolled up in a flour tortilla. Let the kids help make them...it's fun! Spread 1 tablespoon cream cheese on each tortilla to within 1/2 inch of the edge. Top each with about 4 turkey slices, 2 tablespoons picante sauce and 1/4 cup avocado. Roll up the tortillas tightly, leaving the ends open. Cut each roll in half. Serve with additional picante sauce for dipping. This entry was posted on 9:18 PM and is filed under Turkey . You can follow any responses to this entry through the RSS 2.0 feed. You can leave a response, or trackback from your own site.